The sun is in Sagittarius from November 22nd to December 21st. If your sun sign is not Sagittarius, these stones are still useful. The zodiac energy of each sign surrounds all of us based on the time of the year. The energies of Sagittarius are at work now. Sagittarius is a sign of travelers and wanderers. This energy cannot commit to one action or decision and so it seems to be exploding and all over the place. A Sagittarius might tell you that this is the most fun sign of the zodiac. And you can probably trust them because Sagittarius cannot tell a lie. They are direct and frank, which means they tend to hurt people but it is often unintentional. The Sagittarius energy is big and bold. Its the sign that closes the year and sends it out on a bang. Sagittarius is ready to party, which makes the energy seem shallow, inconsiderate and flighty. This is the surface energy, on a deeper level the Sagittarius energy is actually very intellectual and full of thoughts. Coming to the end of the year, use this energy to think about what changes you want next year. What would excite you? Use this time of year and the energy associated with Sagittarius to manifest those plans. Black Obsidian is a wonderful stone to ground the Sagittarius in-your-head energy. Use it to bring your crown chakra and third eye chakra back in line with your root. Use Blue Goldstone to drive your goals. When the Sagittarius energy threatens to push you from one new idea to the next, blue goldstone will keep you on the right path. Blue Topaz can be used to calm down the big bold energy of this time of the year. It can help you to become gentler in your communications. Lapis Lazuli is another stone that encourages gentle and clear communication. It can also encourage your intuition to help you know which of your many goals is the most important at this time. Peridot is a good stone for a Sagittarius to use for protection, healing and comforting. It can be considered a maintenance stone. Another good stone for grounding, Snowflake Obsidian can help bring the Sagittarius energy down from out of your head. Smoky Quartz can be used for grounding as well, Sagittarius really need to cover themselves with grounding energy. Smoky Quartz also transforms negative energy into positive. Use Sodalite for guidance in discovering your path. Sagittarius struggle with committing to one goal, Sodalite can focus that energy into a single direction and strengthens your intuition as to what that direction should be. Turquoise is sometimes called the stone for the traveller or the stone of wanders, which makes it perfect for use when dealing with Sagittarius energy. It is a stone that blends all the classical elements: the color of water, the energy of both fire and air, and the strength of earth. Another name for Turquoise is the stone of warriors, which is the energy of Sagittarius. Amethyst is probably the best stone for grounding the Sagittarius. Sagittarius energy is high in the head. Amethyst is connected to both the Crown and Third Eye Chakra and can work to pull these down to ground. Imperial Topaz gives the user a sense of purpose and gives direction. It is also highly useful in manifesting, which Sagittarius energy is very adept at. Lepidolite is very calming and brings balance to the chaotic world of the Sagittarius. Blue Lace Agate can be used similarly to Blue Topaz. It can help the user speak from a more mindful place. It is much more calming that Blue Topaz so it may be too strong. Labradorite is perfect for esoteric, in-their-head type people. It is good for manifesting which Sagittarius energy is good for. Sagittarius like change more than other sign. The energy is always looking for whats next and what’s new. Labradorite can facilitate this. 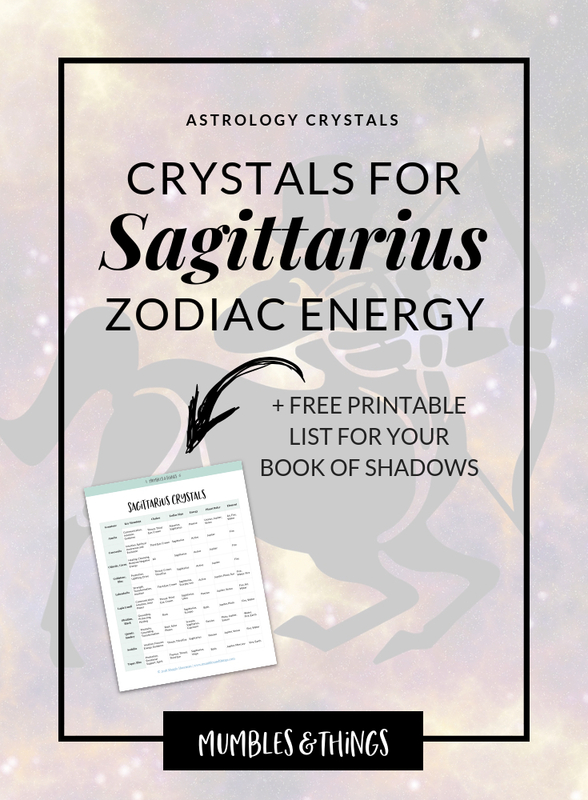 Want my list of Sagittarius crystals? Click the button below to request your list to be sent to your inbox. This list includes the top 10 crystals associated with the zodiac sign Sagittarius, plus, the three key uses, primary chakras, polar energy, planetary ruler and element correspondence.